Updated: We apologize for a major oversight with the original story, which came from a fake Twitter account not affiliated with Asus or the Arez brand. In actual fact, the Arez rebrand is still happening, and these cards will not stay as ROG-branded GPUs as previously reported. 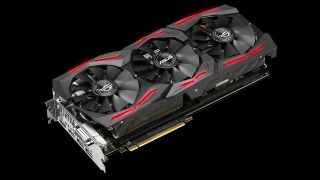 Asus has abandoned plans to launch a new brand of Arez graphics cards, mainly because this is no longer necessary since Nvidia has ditched its GeForce Partner Program. It was last month that Asus announced that its AMD graphics cards would be rebranded as Arez instead of ROG, and that these would be exactly the same GPUs, just with a different name and packaging. However, in a tweet, the manufacturer let us all know that the ROG brand will in fact remain in place, and business will carry on as normal. If you’ve not been following, the only reason Asus was rebranding AMD’s cards was because Nvidia was allegedly insisting that high-end gaming brands were dedicated to its GPUs, if manufacturing partners wanted to benefit from the GeForce Partner Program. And that scheme reportedly offered a whole load of incentives including marketing funds, and more. However, thanks to a lot of flak being fired at Nvidia over the program, the company abandoned the whole scheme back at the start of this month, stating that there were just too many “rumors and mistruths” surrounding it. So there’s no need for the ROG brand to be exclusive to Nvidia, it would seem, and therefore no need to rebrand AMD’s graphics cards. All this initially stemmed from a HardOCP investigation, and AMD was unsurprisingly quick to level accusations of anti-competitive practices off the back of this.